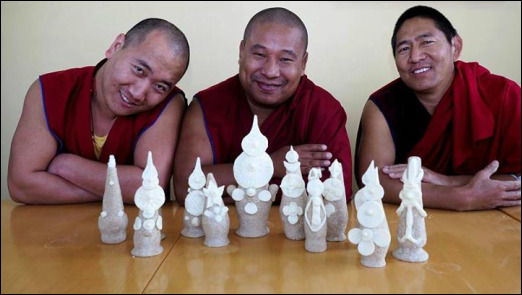 The monks will work with children and adults to create traditional sculptures made from butter, as has been done in Tibet for over 800 years. The monks will work with children and adults to demonstrate beautiful Tibetan calligraphy butter, as has been done in Tibet for over 800 years. Liberation, in the highest sense, is attained through the fusion of the intellect and intuition. The path to freedom requires wisdom, which can only be achieved through the deep questioning of one's beliefs by both oneself and others. 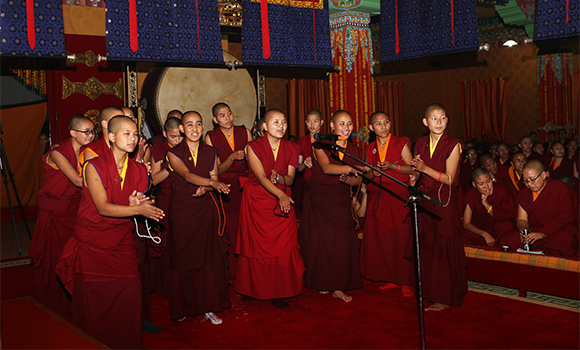 Tibetan Monastic Colleges employ the system of dialectical debate as part of the routine of study for the monks. It is used to dispel doubt and to acquire deep understanding of the subjects being studied. The student is encouraged to question everything related to the topic being discussed (as was also done by Plato and Aristotle in ancient Greece). This is invaluable for sharpening one's wit and testing one's wisdom. Mandala means literally "that which extracts the essence." There are many different types of mandalas used by Tibetan Buddhists. During tour visits, two‑dimensional sand mandalas can be created. These are without doubt the most creative, labor‑intensive, and concentration‑intensive of all mandalas created. The sand is applied very precisely by the gentle tapping of a sand‑filled metal cone that has had its tip removed. The mandala masters must be the first to initiate the mandala, and does so by being the first to pour the sand followed by a team of between 75 and 125 hours of effort. Each sand mandala represents the architectural layout including iconography, placement, and color all have significance. Additionally, to the learned Tibetan Buddhist monk, the mandala represents his vision of the entire universe. Upon completion of the mandala, the monks will purposely destroy the magnificent work of art by sweeping it and place the sand in a river, lake, or ocean as an offering to purify the surrounding environment. Available individually or offered as a large or small group, this session is lead by a Tibetan Buddhist master of purification and has three stages: purification and removing of negativities; removing subtle negative imprints; and offering protection. Conditions often ripen in our homes or businesses and communities which call for powerful rituals to eliminate their effects. The monks can do rituals to transform negative conditions into positive conditions such as eliminating negative forces, increase positive forces, long life, healing, protection, blessing of ldren, transformation of forces in the environment, self initiation into deities mandala and wealth. These need to be discussed personally with the monks so they can decide the appropriate rituals. Guru Puja (strengthen connection with Spiritual Master). One deep chant with cymbals, bells and drums . Additional programming available upon request. The Buddha of Compassion is known as Chenrezig (Tibetan) or Avalokitshevara (Sanskrit), meaning 'liberator from the unfortunate lower rebirths.' Chenrezig pledged in front of all the Buddhas not to attain Buddhahood until all sentient beings were free from the sufferings of samsara. Receiving the empowerment of this Buddha, therefore, provides one with protection from an unfortunate lower rebirth. Chenrezig has many aspects and embodies the Universal Compassion of all the Buddhas of the three times and ten directions. The purpose of the empowerment is to establish a close relationship with Chenrezig and to benefit from his almighty power of compassion. In this era of violence and mental instability, the blessing of Chenrezig is highly sought after, as it helps one to become more peaceful and compassionate, even with the state of current events. The empowerment will also initiate one into the mantra of Avalokitshevara: OM MANI PADME HUM, which contains the essence of all 84,000 volumes of Buddha's teaching. Menla (Medicine Buddha) Menla is the embodiment of the power of healing of all the Buddhas. While most of us are used to taking some form of medication on a daily basis, whether that be in the form of prescription drugs, vitamins, or herbal concoctions, rarely do we find that we feel any better. As has been confirmed by both Western and Eastern scientific research, strength of the mind and will has a major role in the process of healing. For millennia our ancestors have been aware of the effect of spiritual practice upon healing, and have used it as a necessary supplement to medication. The Medicine Buddha empowerment is meant to establish a special connection between the participant and the deity. Once this relationship has been developed and strengthened through the empowerment, the participant will become more open to receiving the benefits of the healing powers of all the Buddhas. OM AH RA PA TSA NADHI. White, Green, 21 Taras Tara (Buddha of Long Life) White Tara is the goddess of Long Life. She is one of the main deities used by both Tibetan Yogis/ Yoginis and lay practitioners in the practice of requesting a long and healthy life. Known particularly for her swiftness in fulfilling the long‑life wishes of the practitioner, White Tara is looked to for happiness and inspiration through the mantra OM TARE TUTARE TORE SOHA. The White Tara empowerment is meant to establish a close relationship between the recipient and the deity. Vajrasattva (Buddha of Purification) Vajrasattva is the Buddhist deity of Purification. The practice of the Vajrasattva deity purifies all negative actions committed by our body, through our speech, and in our minds. All that has been contaminated through our own negativities will be cleansed, and we will be able to begin afresh. The Vajrasattva practice is also capable of uprooting and purifying the negative imprints that we have carried over from our previous lives. This empowerment will include the transmission of the 100 Syllable Mantra. Lam Rim: Review of the Graduated Path with a focus on Renunciation, Bodhicitta (altruistic motivation), and Emptiness. Lectures may be personally tailored and organized for some K-12 school, college classes, and public venues.